The water industry in the UK faces a turning point in the use of instrumentation with the advent of TOTEX (capital expenditures [CAPEX] + operating expenditures [OPEX]) within the current Asset Management Period, the sixth since it privatized in 1989. The industry now has concepts such as Big Data, the Internet of Things (IoT) (and its big brother, the Industrial IoT, or IIoT), “smart” systems, and “small information.” Instrumentation is a crucial factor in all of these concepts, and the power that lies in them is to find out what is actually happening on a day-to-day basis in the various systems that the industry operates. The problem that the industry faces is that, at times, instrumentation has been an afterthought and has been installed as one of the last things in a scheme as an “add-on” without thinking of the purpose of that instrumentation. This has resulted in a “resistance to the effective use of information” and the collection of hundreds of millions of pieces of information a day with no real purpose, the so-called DRIP phenomenon — Data Richness Information Poverty. The problem was that instrumentation, although it had been around for many years, was something that people with the industry knew that they needed, but didn’t really know what they wanted to do with it. 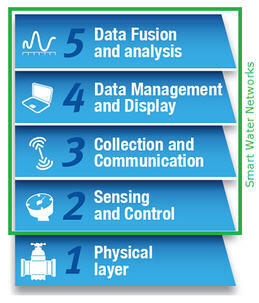 The SWAN Network layers diagram (Figure 1) neatly highlighted instrumentation’s place within the water industry. The fact that Instrumentation is part of a Smart Water Network is a moot point for the wider industry; it is the systematic approach that is important. The fact that instrumentation in the UK has typically been installed as part of a large capital scheme and typically as an add-on is a problem for the current industry as the number of these capital schemes decline. As such, a new type of scheme to adopt instrumentation and control systems may well be required. In order to do this, an examination of how we install instrumentation, from concept to replacement, is needed. The rest of this article will touch on some of the concepts that need to be looked at. The water industry, when it has traditionally installed instrumentation, has taken a CAPEX/OPEX approach. Instrumentation has typically been installed as part of a capital scheme to install a new treatment plant or, more commonly, a process within a treatment plant. Instrumentation has been installed to monitor and control the various elements, mostly (although not always) with some sort of SCADA-based system (depending upon the size of the plant). The instrumentation has been proved in a commissioning program and then handed over to operations. The instrumentation then gets replaced as it breaks in the subsequent years (Figure 2, below). What tended to be missing from this approach was that there was no defined purpose for an instrument besides simple monitoring and control because the Capital Scheme was focused on delivering one particular element of a system and was not funded to look at the system as a whole and how that system works. What has highlighted the problems with this approach is the Advanced Process Control schemes where instrumentation has been used effectively delivered in conjunction with engineering partners and supply chain companies. Where this approach has been taken, the model has been repeated and repeated again as the efficiency of the treatment systems have noticeably improved. What this shows is that the steps in bringing an instrumentation system together are all important. These are the basics on installing and operating an instrument or an instrumentation system, but often steps in this process are missed. Let’s look closely at the process. Tier 1: Simple state capture – Any process in the water industry is an ever-changing or unsteady state. The instrument in Tier 1 use is simply there to capture and report on the state that the monitored process is in for the parameter or parameters that it is monitoring. Tier 2: State capture and simple control – In Tier 2, the instrument is there for some sort of control function, either inputting into a wider control system or providing a simple control function. For example, a level controller on a pumping station. Tier 3: State capture and advanced control – In Tier 3, the instrument is there as part of an advanced control system. It is inputting into a predictive-model-based control system as part of a feed-forward control, or providing an input into a feedback control system or some sort of cascade loop control system. 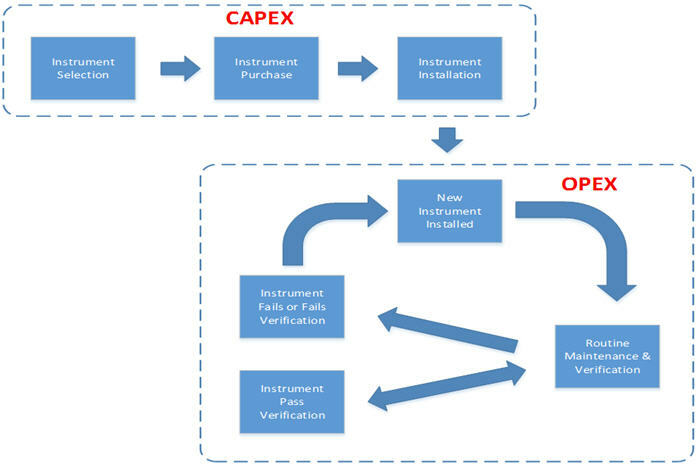 These tiers are arguable at best, but they demonstrate that defining what an instrument is for will have a fundamental influence on the next steps within the process of the installation and operation of an instrument. Instrumentation selection is where the water industry often excels, but the nuances of instrumentation selection are sometimes missed, especially if an instrument’s use has not been correctly defined. 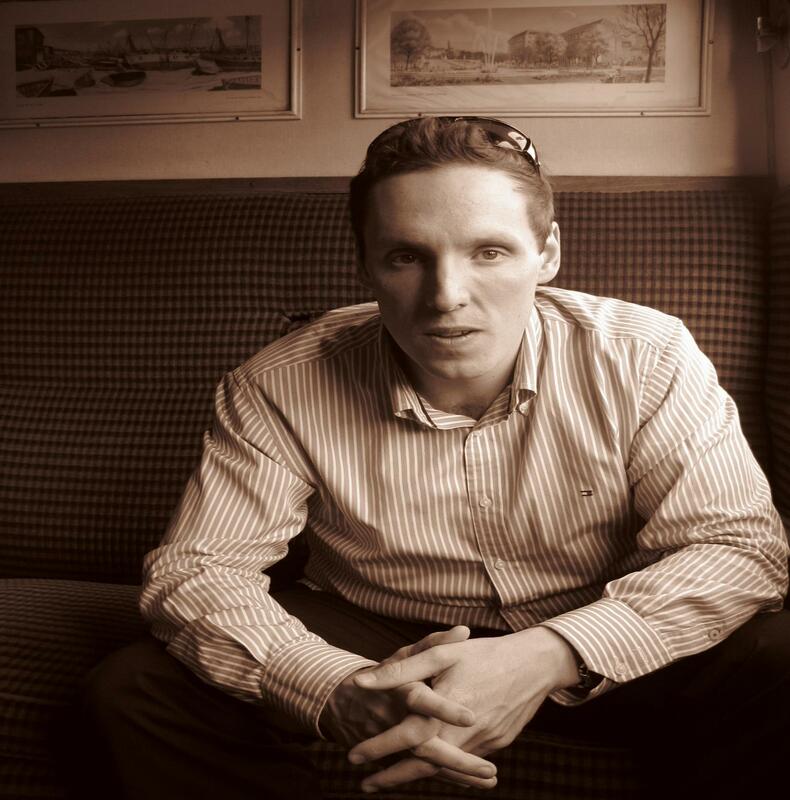 The problem that the water industry has is this: unless it is installed on a newly built asset, the selection and subsequent installation is often a compromise. As such, the mode of operation is also a compromise and the instrument is not allowed to function as it necessarily should. Instrumentation is often application-specific, and unless major and expensive modifications are made, a compromise exists. What this means in the current water industry is that supply chain application specialists from the different suppliers are often an absolute necessity in looking at specific applications for the different instrumentation types. Cynicism will often exist insofar as engineers will often think that an instrument is being sold for the sake of getting a sale; generally this is not the attitude that needs to be taken, and better cooperation between engineer and application specialists are crucial to the correct installation selection. The installation of instrumentation should be part and parcel to instrumentation selection, and the role of the application specialist cannot be underestimated. There are a number of questions to ask when installing an instrument within the water industry, especially the wastewater side of the industry due to the hazards that are ever-present. Can the instrument being installed effectively and accurately measure within the environment that it is being installed in? Once installed, is access to the instrument and its associated parts for operation, maintenance, and verification purposes possible? Can the instrument be replaced easily and relatively quickly? The first question seems to be obvious, but mistakes are made — like not installing appropriate up- and downstream diameters for electromagnetic flow meters, installing multi-parameter devices in conditions that are too turbulent to measure. It is this question that the applications specialists from the supply chain companies will often answer. Input from operational staff is often useful as well, as is advice from entities such as the Environment Agency’s MCERTS scheme. The second question needs to involve operational and maintenance staff and an understanding of how an instrument is going to be operated and maintained, and perhaps inspected, is needed. Even if it’s a case that a meter is there just for Tier 1 measurement and is going to be effectively left to run to failure, then the operational needs must be taken into account; otherwise, ask the question as to the usefulness of the instrument and whether or not the data that it is going to produce is actually needed. The last question is “How, once an instrument is installed, is it going to be replaced? And what’s the timescale for replacement?” For example, if it is a process-critical instrument that needs to be replaced in a matter of seconds, minutes, or hours, then the installation must reflect this. This may mean providing standby instrumentation in some case, or this could be as simple as removing the instrument from the process temporarily or providing a bypass to the main flow as appropriate. Without each of these elements, the instrumentation will fail. The technology involves installing the correct instrumentation in the correct place, in the correct way to enable O&M. The system involves knowing that the instrument exists and the right measures are in place to ensure that the instrument can be operated and maintained. Those that operate and maintain the instrument must have the correct training and knowledge, but also have correct tools to do so. The culture feeds from the definition of the instrument. Often there is the culture within an organization that says that an instrument (or anything) should be operated because there is a job on the system to do so. 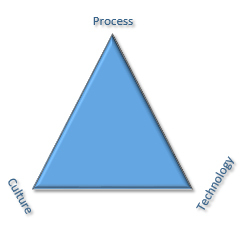 However, if the operator or maintenance technician knows why an instrument is important and the job that the instrument does, then the job the operator is doing provides value, the instrument exists as more than just another something that gathers data to be ignored (instead becoming a valuable tool), and the culture of instrumentation becomes ever-present. Currently, instrumentation tends to undervalued in the water industry and this is because its use is not fully defined. Instrumentation tends to be installed as part of a major capital project and maintained in an almost status quo-like environment. As schemes come along at the treatment plant, the system is added to and eventually becomes piecemeal. On the networks, especially the wastewater networks, instrumentation outside of pumping stations is near non-existent; when pipework is replaced or even installed as new, instrumentation simply isn’t part of the equation. The question needs to be asked as to whether or not the water industry wants to take an instrumentation-based systematic approach. Recent studies have shown that the performance of the wastewater industry could significantly improve and that overall environmental quality could be improved by controlling the wastewater network. This would, of course, need instrumentation to achieve this. A start to this is the event duration monitoring that will be taking place in the UK prior to 2020. This is a start and a start only. In order to achieve effective gains, instrumentation and control schemes are required across the whole of the water industry, especially on the wastewater side. This toilet-to-source approach needs to be taken in a systematic way, defining what it is needed and installing instrumentation systems based upon their own merits. The benefits of this are often undefinable in a financial point of view without intelligent “guesswork.” But where control and advanced control systems have been installed, they have often proved that the benefits are far greater than were originally thought. This is a big leap for the water industry, but it is a leap that needs to be taken. Instrumentation is the fundamental start of this leap.